So I learned today. The thinner tender scapes from my garden are nowhere near as intense as the ones we got in the CSA box. Now I understand why people who aren’t huge garlic lovers don’t care for scape pesto. It can almost knock you over with the intensity. I did figure out how to tone it down a bit, after my first batch. I made sure I labeled them differently so when I pull the first batch out of the freezer I can add orange juice and a little lemon olive oil to tone it down. Thinner, shorter not as thick a green stem. Some of these quite thick and two distinct shades of green. The first batch in the processor made from CSA scapes was peppery, intense, in your face garlic flavored. I could have doctored it up after I started tasting it, but decided to freeze the first batch and deal with it later. The second batch I added a bit of juice and used some of my St. Helena lemon olive oil. A little more cheese, and more pine nuts. Lots of little containers to go in the fridge and freezer. This year I decided to do small batches. Just enough to put in the crock pot or to add to pasta for one meal. 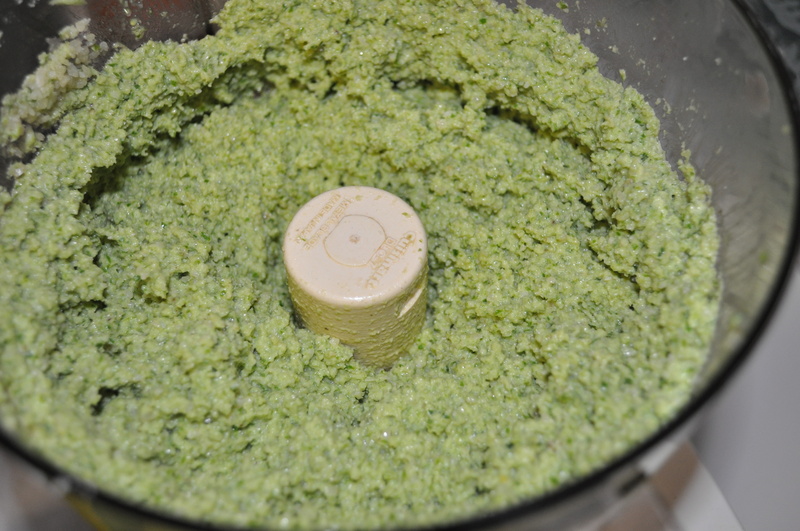 Put the first three ingredients in a food processor. While running, add olive oil to get consistency desired. Stop processor. Taste. Add salt, pepper and squeeze of juice and pulse a few times. I fill small containers. Add a thin film of oil on top. Close, label and freeze. Whatever I put directly into the fridge gets the layer of oil to keep it from oxidizing and turning dark. I made two double batches from all the scapes I got in the CSA box and from Breezy Willow. 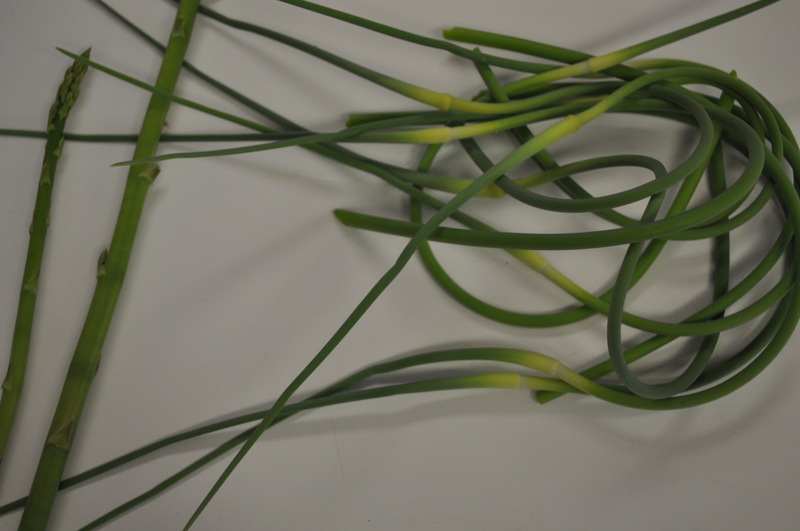 My little scapes are going to be grilled, to be served with grilled asparagus (whenever it stops raining). Posted in CSA, Food, Gardening, Real Food and tagged cooking, CSA, Food, foodie, gardening, grilling, Locavore, real food. Bookmark the permalink. 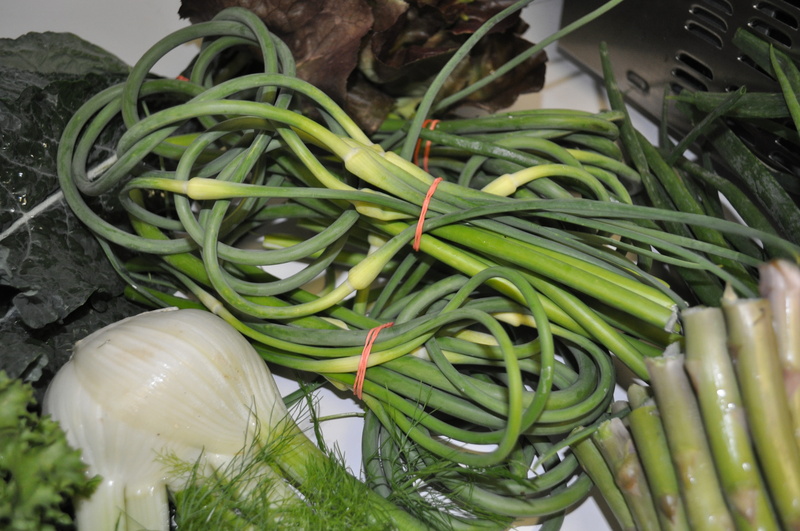 I received scapes from the One Straw Farm CSA this week. Thank you for the recipe. I’m going to try it. The other items for the week are swiss chard, red lettuce, green lettuce, collard greens, kale, radishes, and strawberries 🙂 . I’d be willing to bet that the garlic variety & soft/hard neck factor in too. Gorman (which i planted) uses a purple variety (from maybe Italy?) & LD a German variety…I’ll have to do a taste test. Which variety & soft/hard neck did you grow? 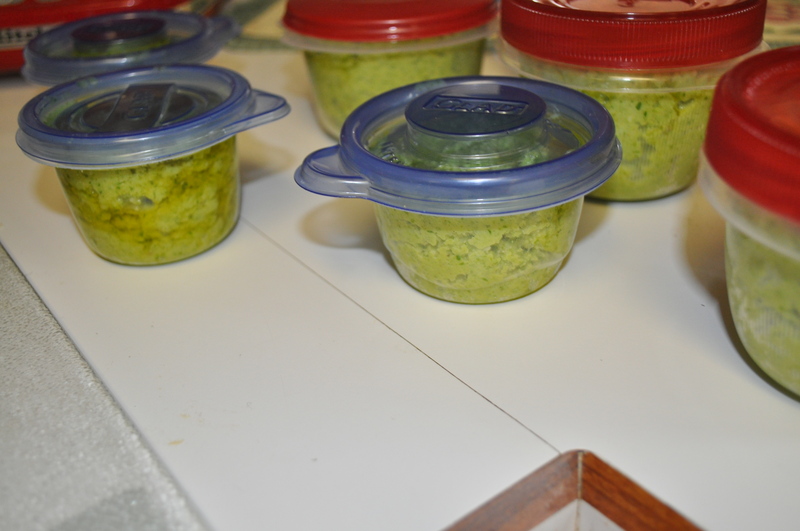 Your pesto looks fabulous….I’ve been cooking with them, maybe a pesto this weekend. Thanks for the recipe! We’ve still got a bit of time before the rest of the garlic forms scapes, so I’m glad to have this ready to go. I grow both elephant garlic and regular garlic, and I’m curious if there’s a taste difference in scapes from the two plants. If I were a more organized gardener I’d know which green plants sprung from an elephant bulb and which spring from a regular bulb, but I’m not that organized. It’s just a bed full of thriving green to me.